Begin at: Mirror Lake Trailhead (shuttle stop #17) at the Stone Bridge. From the shuttle stop (#17), a paved trail leads directly to Mirror Lake. At the stone bridge, you can turn right to take the five-mile loop or remain on the paved trail to continue to Mirror Lake. Mirror Lake has little water much of the year, but in spring and early summer it can grow in size. When water is calm, the lake offers beautiful reflections of surrounding cliffs. Exhibits detail the story of the area’s lake-to-meadow succession. This can be a good place to spot wildlife like coyotes and bobcats. 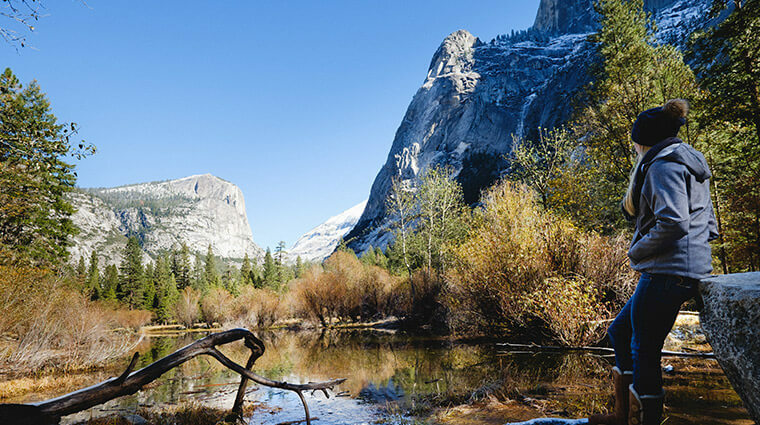 This is a great hike in Yosemite to do in the fall and winter because the trail is accessible year round. This is also a great option for biking. You can bike nearly the whole trail to Mirror Lake except for the last 1/4 mile. You will see bike racks at the point in the trail when bikes are no longer allowed. Take a virtual visit to Mirror Lake.